Reprinted from the Cottager's Newsletter, Fall 2000, courtesy Manitoba Conservation. Images by NN. Though first published in 2000 in response to a tent caterpillar "outbreak" in southeastern Manitoba, the information in this article remains relevant, especially as we are nearing the time when a tent caterpillar explosion may reoccur. They normally occur at 15-20 year intervals. 2016 Update: Numbers of Forest Tent Caterpillars in Whiteshell Park may be heading towards another big spike in 2017! Significant numbers of FTCs have been noted in the Park this spring, with numbers similar to those that were apparent in 1999, the year preceding the major defoliation event of 2000. 2017 Update: Forest Tent Caterpillars (FTC's) are again wreaking havoc in parts of southern Manitoba. The City of Winnipeg sprayed various areas with the biological agent Bt. In south Whiteshell, where I had predicted a major breakout this spring, infestation has proved to be less than expected. There are lots of individual stripped aspen trees, but it looks like, as of June 8, that there will not be a major defoliation event this year. There's already lots of Flesh Flies around suggesting that FTC numbers have likely peaked and will decline in the coming years. But we'll see what happens in 2018!? As many of us witnessed this past Spring, cottage subdivisions in Whiteshell Park, Nopiming Park, Turtle Mountain Park and some other Manitoba provincial parks suffered from a major outbreak of forest tent caterpillars. In several parks, this was the second year they were present in significant numbers. Trees and shrubs in many areas were completely defoliated, and the "moving carpet" of caterpillars temporarily prevented many people from fully enjoying their cottages. The forest tent caterpillar, Malacosoma disstria, is a serious defoliator of hardwood trees across much of Canada and the United States. 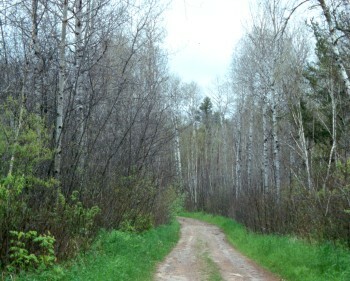 Severe outbreaks, such as occurred in the Whiteshell, Nopiming and Turtle Mountain Parks in 2000, defoliate thousands of hectares of deciduous trees and shrubs. 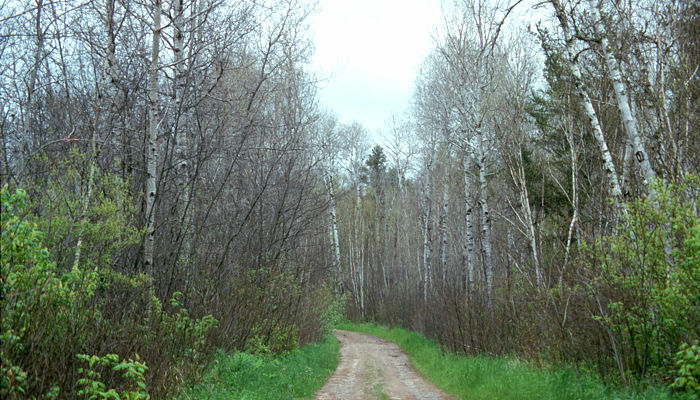 A defoliated forest, Whiteshell 2000. A larger image of the "destruction". The preferred host tree, trembling aspen (commonly known as poplar), often occurs in pure stands with few trees of ether species present. Such pure stands contribute to the development of widespread caterpillar outbreaks. The caterpillars also feed voraciously on foliage of various other broad-leaved trees and shrubs. 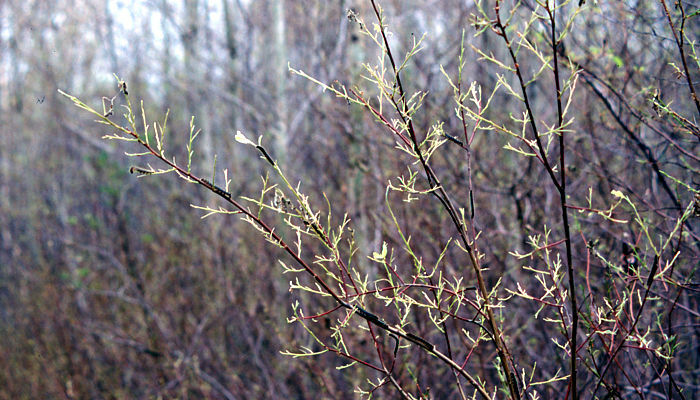 In many areas birch, oak, and other tree and shrub species were defoliated. The adult moths are light brown in colour with two darker oblique bands running across the fore-wings. Their wingspan is 30 to 45 mm. Females are stout-bodied while males are more slender. One hundred and fifty to two hundred grey coloured eggs are laid in bands, 5 to 15 mm wide encircling a twig. 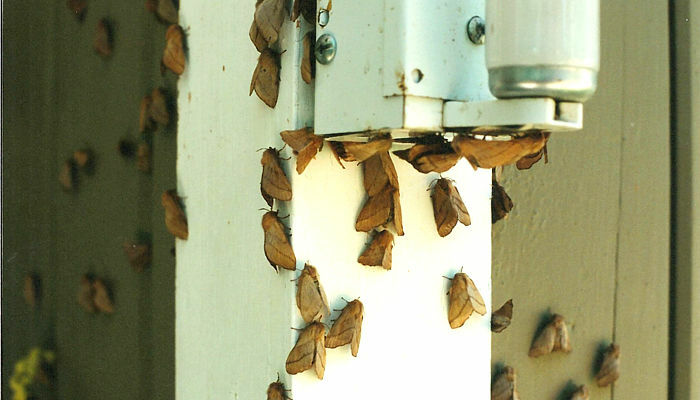 Adult moths on a cottage. Young caterpillars are uniformly black with dark hair. 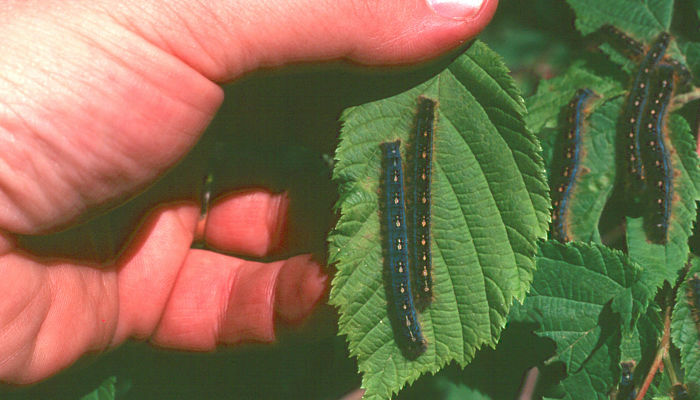 Mature caterpillars are dark brown with a broad band of blue along each side. There is a row of white to cream coloured keyhole-shaped spots down the center of the back. Four very fine orange lines extend the length of the body. The caterpillars progress through five stages called "instars". Size of fully grown caterpillars. Light yellow silken cocoons are spun between leaves of host trees and other vegetation or in any other sheltered location, such as under eaves of buildings. Egg mass on a twig. 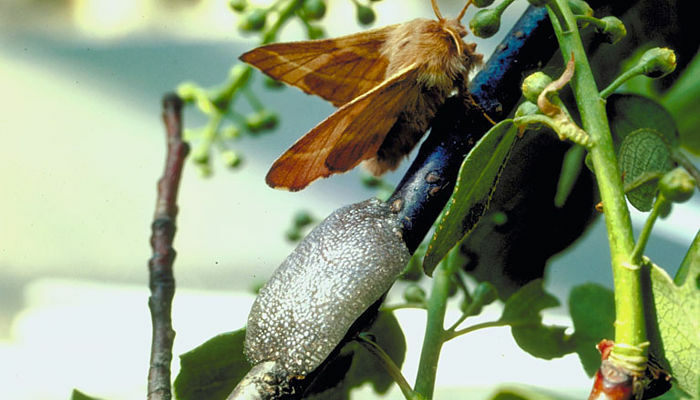 Eggs are laid by the moths from July to early August and hatch in spring. Hatching coincides with bud development on the host trees. The tiny caterpillars feed openly in colonies on the unfolding leaves. Contrary to their name, they do not construct distinct tents. Instead, they spin silken threads along which they travel. The larvae often cluster together while resting or during molting. There are five larval instars, or stages, per season. There are several species of tent caterpillars. The one that does make tents is called Malacosoma americana. This is a picture of that species' tent. The greatest amount of feeding occurs in the fifth instar when a caterpillar may consume up to seven leaves. In this stage, the caterpillars migrate in search of new food supplies or suitable cocooning sites. After five to eight weeks of feeding, the caterpillars spin silken cocoons, usually in late June. The cocoon stage is normally ten days. Adults emerge in July, mate and lay their eggs. The adult moths are active fliers and can be carried for several hundred miles on air currents. The adult moth stage lasts from five to ten days. Fortunately, there is only one generation of moths or caterpillars each year. Caterpillars can cause substantial growth loss during each year of severe defoliation, but do not cause long term damage to healthy trees. Feeding damage ranges from a light thinning of the crown to complete defoliation, depending on caterpillar numbers. Serious tree mortality does not normally occur as trees grow a new set of leaves later in the season. Following two or more years of severe defoliation there is usually a general decline in tree vigor leading to twig and branch die-back. If three or more consecutive years of complete defoliation occur, trees can became weakened, making them more susceptible to attack by other insects and diseases. Caterpillars can also have some positive results to ether tree species. The growth of spruce and other coniferous trees which often grow under the aspen stands is usually improved. Forest tent caterpillar populations are controlled by a variety of natural factors. An exhausted food supply due to high population levels and late spring frosts which destroy foliage, can cause mass starvation. Excessively high temperatures during the moth stage of the life cycle can cause substantial adult mortality and reduce egg viability. Numerous parasites also play an important role in population control. The most effective parasite is the flesh fly. Adult flies lay live maggots on tent caterpillar cocoons. The maggots burrow through the silken case to feed on the pupa. A good bug to have around! 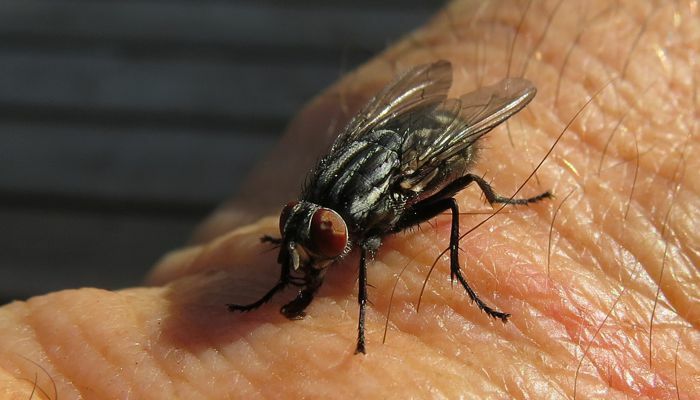 The Flesh Fly (Sarcophaga aldrichi), also known as the "Friendly Fly" is a real friend to us when it comes to controlling FTC's. It deposits its larvae on FTC cocoons and the maggots eat the pupa inside, killing it. Then the maggots drop out and pupate underground, emerging as adults the following spring, where they will hunt down and kill more FTC's. The numbers of Flesh Flies increase with the rise in the population of FTC's, ultimately helping to knock the FTC population down. An adult Flesh Fly, one of the good guys! The chemical insecticides, carbaryl, malathion, and methoxychlor are registered for forest tent caterpillar control, but cottagers and other park users should be cautious about use of these chemical insecticides. These products may impact many species of insects, birds and other animals. More environmentally friendly biological insecticides such as Bacillus thuringiensis (B.t.) a bacterial insecticide also provide effective control. They do not kill such a broad spectrum of organisms as chemical insecticides. These biological insecticides are lethal to a number of caterpillar species, and may affect other types of moths and butterflies. These products must be applied to the aspen or other leaves and then ingested by the caterpillars to be effective. Insecticide spraying should be carried out in late May or early June when the caterpillars are in the second or third instar, prior to significant defoliation. Cottagers can effectively protect many of the trees on or near their cottage lot by spraying from the ground. Where feasible, control may also be achieved by removal of egg bands from the twigs. It is quite likely that the tent caterpillar infestation next year will be severe in much of the Whiteshell, Nopiming, Turtle Mountains, and possibly Moose Lake and Hecla/Grindstone Provincial Parks, as well as some other parks where cottages are not present. However, weather and other conditions leading up to the Spring, 2001 emergence may affect their numbers. Manitoba Conservation, Forestry Branch will conduct an egg band survey this Fall to predict next year's defoliation. In many areas, 2001 will be the third year that they have been present in large numbers. 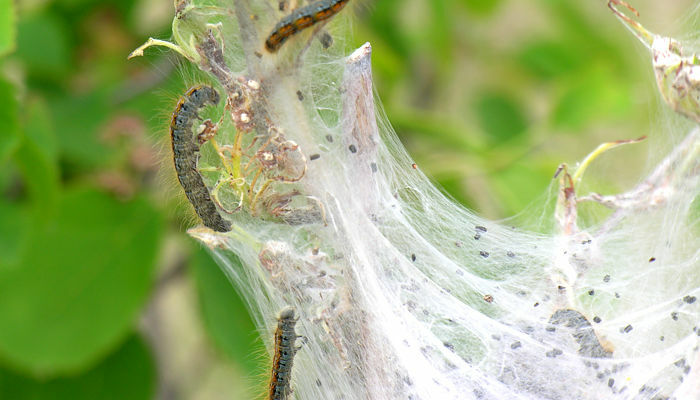 Widespread forest tent caterpillar outbreaks occur approximately every ten to twenty years, often persisting for three to five years. After that time, natural parasites generally end the high population phase of the caterpillar cycle. Manitoba Conservation has made the decision that aerial spraying of insecticide for aesthetic reasons in our parks will not occur in 2001. During the past summer a number of cottagers and other park users have expressed to the Department their views about spraying. Some are in favour, some strongly opposed. The presence of large numbers of forest tent caterpillars is a natural phenomenon that has occurred a number of times in the recorded history of Manitoba parks. Manitoba Conservation does not promote the disruption of this natural cycle by spraying in provincial parks, when overall forest health is not threatened. After surveys are completed this Fall, Manitoba Conservation will contact cottage association executive members with the results about probable infestation levels in 2001. This information will be communicated to all cottagers next Spring, and cottagers will also be advised how to best control caterpillars on their lot in an environmentally friendly manner. Thanks for learning about Forest Tent Caterpillars! Bye for now!